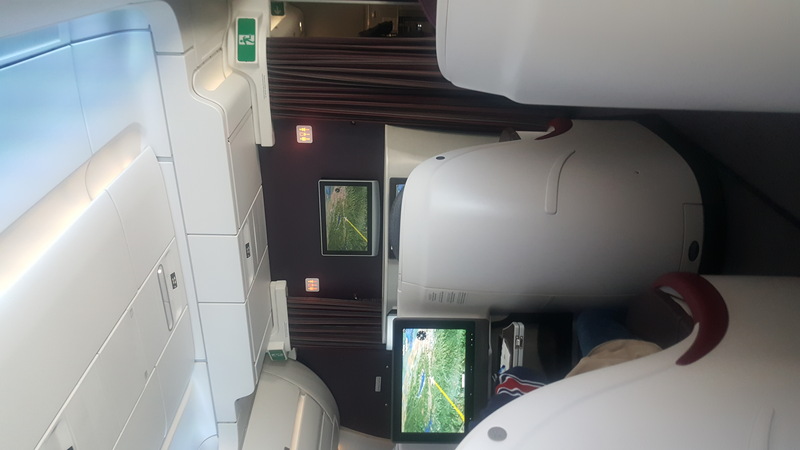 I had booked business class for this trip to the UK but was pleasantly surprised to be upgraded to first class on checking in and I didn't even ask for it. Seat 1A is the very first seat on the top deck of the A380 on the left hand side of the aircraft. The bathroom is just through a curtain and is seriously the largest bathroom I have ever encountered on any aircraft. The facilities overall were faultless and the a la carte menu to die for. Easily the most comfortable and widest seat I've come across in the sky. The entertainment system has so much choice it would take half a lifetime to watch all of it. The only criticism I could make is that the hand held control was very slow to respond and the touch screen too far away to use but hey, that just goes to show how much space you get in this luxurious seat! 5 stars all round. A350 is definitely the quietest plane. I upgraded myself from economy to business class from seat 32 to 22E. Being close to the lavatory, you can hear the toilet flush. service was excellent and entertainment was superb. The seat is close by the lounge which was very comfortable and I think its a plus for long flights. I will always fly Qatar airways.